A recently published article by a group of Korean researchers hints at a possible cause of bipolar mania. The finding underlines the complex biology of bipolar disorder and perhaps why coming up with a biological mechanism for the dramatic shifts in behavior in bipolar has been so difficult. A number of pieces of evidence have suggested that phospholipase C signaling may be involved in the biology of bipolar disorder. Phospholipase C (PLC) is a “second messenger” which has many functions in the organism. However these different functions are all a consequence of Phospholipase C’s ability to catalyze the reaction illustrated below. The formation of diacyl glycerol (DAG) (which stays on the inside of the cell membrane) and inositol 1,4,5-trisphosphate (IP3) (which diffuses into the cell) from phosphatidylinositol 4,5-bisphosphate (PIP2) lying on the inside of the cell membrane. PLC also comes in multiple variants with slightly different regulation and function. Multiple genome-wide association studies identified phospholipase C (PLC) signaling as a pathway that contributes to the risk for bipolar disorder (Nurenberger, 2014)… A genome-wide linkage analysis study also identified a gene encoding phospholipase Cγ1 (PLCG1) as a susceptibility locus for bipolar disorder (Radhakrishna, 2001). Indeed, BD patients with a dinucleotide repeat in the PLCG1 genomic region are good responders to lithium, suggesting involvement of the PLCγ1 signaling pathway in BD (Turecki, 1998). Interestingly, PLCγ1 controls recycling of IP3, which is modulated by lithium (Berridge, 1998). This study involved generating mice that lacked a functioning phospholipase C gamma1 (PLCγ1) enzyme in the forebrain (complete deletion of the enzyme kills mice). These mice had several features consistent with human mania. They seemed to lack the usual level of anxiety when exploring new areas. They were much more drawn to pleasure (hyperhedonic) than normal mice. 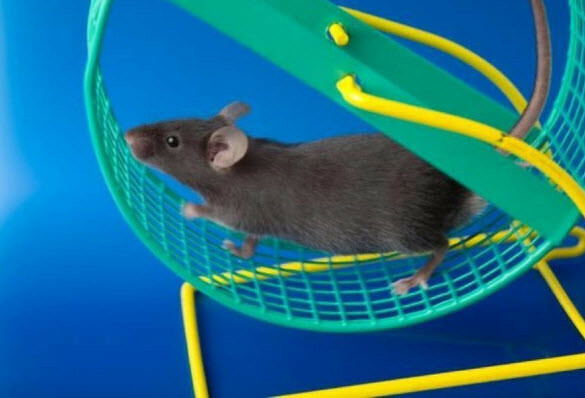 They were much less likely to learn to avoid dangerous situations than normal mice. The authors found that the PLCγ1 deficient mice had reductions of inhibitory input (from GABA neurons) into the hippocampus (affecting memory formation) and striatal dopamine 1 neurons (the striatum is a critical component of movement and reward systems in the brain). This may be the result of impaired localization and/or stabilization of postsynaptic Ca2+/calmodulin-dependent protein kinase II (CaMKII ) at inhibitory GABA synapses. Finally the authors showed that treating the PLCγ1 deficient mice with lithium or valproate reversed these effects, making them resume normal mouse behavior. If these results are confirmed, this mouse model could lead to a better understanding of human mania and the ability to develop new and possibly more effective treatments of mania. Other models for mania in mice have been proposed. Whether this model is a better one will depend on replication. Berridge MJ, Downes CP, Hanley MR. Neural and developmental actions of lithium: a unifying hypothesis. Cell 1989; 59: 411–419. Radhakrishna U, Senol S, Herken H, Gucuyener K, Gehrig C, Blouin JL et al. An apparently dominant bipolar affective disorder (BPAD) locus on chromosome 20p11.2-q11.2 in a large Turkish pedigree. Eur J Hum Genet 2001; 9: 39–44. Turecki G, Grof P, Cavazzoni P, Duffy A, Grof E, Ahrens B et al. Evidence for a role of phospholipase C-γ1 in the pathogenesis of bipolar disorder. Mol Psychiatry 1998; 3: 534–538. Seok H, Kim SH, Choi JH, Choi YB, Cocco L, Ryu SH, Kim JH, Suh PG.